The first Temple built by Solomon was constructed from plans given by God to David. When God refused David permission to build the Temple (2 Samuel 7 and 1 Chronicles 17), David took the plans and gave them to his son and designated heir, Solomon (1 Chronicles 28:1–19). Solomon constructed the Temple according to those plans. This article will discuss the details of the plan. Dr. Martin wrote that the scene in Eden in the early chapters of Genesis shows that the Garden within Eden was a sanctuary where God dwelt. 1 “God planted a garden eastward in Eden” (Genesis 2:8). The structure of Eden and its environs were in the shape of the later Tabernacle and Temples. In Genesis 6:13–16 we have the digest account of God giving Noah specifications for construction of the Ark. There is no mention that a “pattern” or model was given to Noah, although the measurements of length, breadth and height were precise. Moses was also given instructions for the tent structure that God wanted built — the Tabernacle. When Moses was up in Mount Sinai God showed him the “pattern” of the Tabernacle and all the instruments that were to be used within it (Exodus chapters 24–31). He was instructed to make the Tabernacle and the instruments exactly as God showed him. David greatly desired and intended to build the Temple, but God prevented him from doing so because he was “a man of war, and has shed blood” (1 Chronicles 28:3). David therefore gathered all the necessary materials together for the construction of the Temple. When David was near death he had Solomon, prince and heir to the throne (chosen by God, 1 Chronicles 28:5 and 29:1), brought before him with the people of Israel attending. All were to be told important information concerning the construction of the Temple that God would allow Solomon to build. David gave Solomon “the pattern” of the Temple. 3 This pattern was the design that David himself intended to use to build the Temple. David made it clear that Solomon was to use the same pattern that David wished to use. Although Solomon would perform the actual construction of the Temple, it would be the design that David intended. I have set out the verse in an outline format for clarity. God even specified the weight in gold and silver for the various implements and tools used for the future Temple service. All were part of “the pattern” as were “the courses of the priests and the Levites” and even how they were to do the work. That is a great amount of detail. This is remarkable! David states precisely that God gave this information to him “by the spirit” (verse 12) and “in writing by His hand … the works of this pattern” (verse 19). The information is apparently as detailed as were the instructions given to Moses for the Tabernacle. Remember also that Moses received the tablets of stone that were “written with the finger of God” (Exodus 24:12, 31:18, 32:15–16) after God spoke the words to the assembled tribes of Israel. David, similar to Moses, received a “pattern” that was in God’s own handwriting. David concluded his instructions and told the assembly about all the provisions he made according to the “pattern” that God showed him. Then David asked the people to participate by giving their treasure for God’s Temple and they responded generously (1 Chronicles 29:1–19). 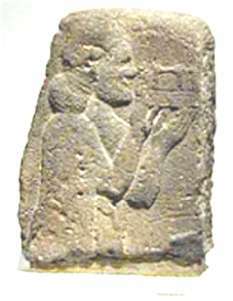 A man holding a model of a temple — similar perhaps to the “pattern” that Moses was shown and that King David gave to Solomon. The figure has a beard and braided hair and he is a Syrian. There is no way to tell if the figure is a god or a man. It is not important whether the person depicted is a god or a human. It is not important whether the model is a temple, a house or a palace. What is important is that this carving depicts a model of a building in ancient times, 7 a fitting usage of tabniyth to describe a model. The timeframe of the artifact’s making is some 150–200 years after King David’s time, although such dating is problematical and often speculative. It cannot be known if the model depicted was made out of wood or stone, or whether the model represents a temple or a palace. It is clear that the model was important enough to be built, presented and held up to someone as represented in the bas-relief carving. And finally, the relief shows that it was a sufficiently important event to carve a memorial in stone of the model and its presentation. We cannot know the kind of pattern that David received from God. It may have been a set of blueprint-like drawings on parchment. The “pattern” may have been detailed descriptions (like those were given to Moses) from a visualization of a three dimensional object. We cannot know for sure and we do not need to know. We can know for certain that the pattern David received from God was “by the spirit” (verse 12) and “in writing by His hand … the works of this pattern” (1 Chronicles 28:19). David passed that “pattern” on to Solomon, commanding him to build the structure as given by God (compare 1 Chronicles 29:1 with v. 19). The measurement dimensions of the various structures of the Temple complex are detailed in 1 Kings 6:2–38 and 2 Chronicles 3:3–14. The accessories and other items for the Temple are discussed in 1 Kings 7:13–51 and 2 Chronicles 2:13–14, 3:15–5:1. All were made according to “The Pattern of the Temple” that God provided God provided. God also provided the location of the Temple. God chose Solomon to construct it. God provided the measurements and the weight specifications. God provided peace so the Temple could be constructed. God provided, through David, all the materials for the Temple. God even designated the format of services. Just before His ascension into heaven Jesus told His disciples He was going to prepare a place for them (John 14:2–3). He was speaking about preparations for you also. Know for certain that your place in God’s Living Temple is being prepared with far greater care than any physical Tabernacle and Temple. Read John 2:19–21; Romans 12:5; 1 Corinthians 6:19, 10:16, 12:12–27; Ephesians 3:6, 4:12 and Revelation 21:22. 1 See chapter 15, “The Garden of Eden, the Tower of Babel and the Temple of God” in The Temples That Jerusalem Forgot (Portland, OR: ASK, 2000), pp. 248–261. 2 See also the descriptions of the naos translated Temple in the KJV in the book of Revelation, particularly Revelation 11:1–2. 3 “Pattern” is the same Hebrew word Moses used to describe what he saw on Mt. Sinai when he received the Tabernacle details. 4 These words are not in the Hebrew, but they are implied. “And there appeared in the cherubims the form [tabniyth] of a man's hand under their wings. 6 “Aram” is another name for Syria. A full 360 degree rotational view of the room this artifact is displayed can be seen at the website of the Bible Lands Museum, Room 13. Go with the viewer to the right and you will see this artifact. You can also zoom onto the image and get a good view of the original. The webpage is: http://www.blmj.org/TheMuseu/virtour/gal13/gal13.html. 7 Architects of every major construction project today have architectural models built beforehand so that people can conceptualize a project or a building. It gives the viewer a sense of the project. 8 The movie King David (1985) starring Richard Gere puts forth its understanding of these verses in Chronicles of a “pattern.” The film depicts David eagerly examining a model of the proposed Temple. When David receives word from God that he would not to be allowed to build the Temple, David destroys the model. It is important to note that such a pattern or model did actually exist. It is doubtful that David destroyed it because he commanded Solomon to follow the “pattern” God gave him. 9 From Amihai Mazar’s, Excavations at Tell Qasile, Qedem 12, (Jerusalem, 1980), pp. 87–100. 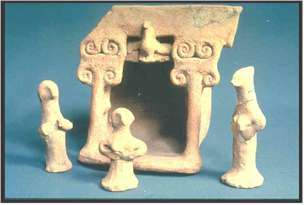 When I dug at Tel Rehov during the summer of 2003 (the dig was supervised by archeologist Amihai Mazar), the fellow next to me uncovered a clay incense burner with a different shape, but just as detailed as the one shown. It too had the shape of a building, presumably a temple. 10 The model on the right with the figures looks much like a holiday crèche, does it not? Where do you think such traditions come from? They come from paganism, of course. “Learn not the way of the heathen” (Jeremiah 10:2).